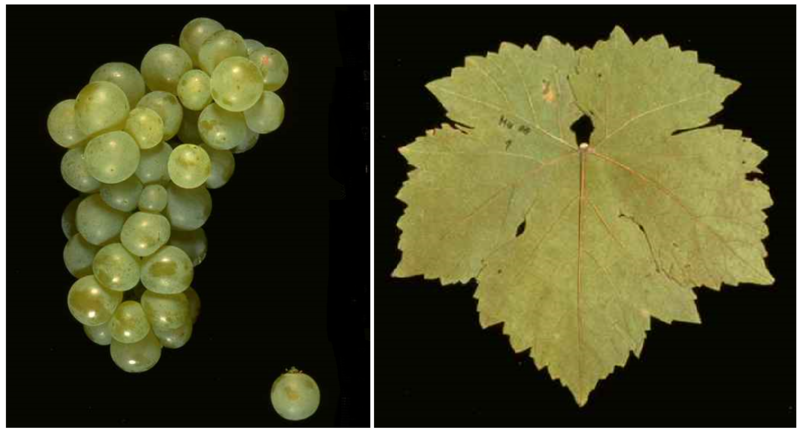 The white grape variety comes from France. It was made in 1839 in France in Angers by Jean-Pierre Vibert (1777-1866) from a seedling selected and then released in 1852 by M. Robert for cultivation (see also under Moreau-Robert ). It was named after a certain H. Ottonel, but the reason is unknown. Synonyms are grouped alphabetically by country Muscat Otonel ( Bulgaria ); Nutmeg Ottonel ( Germany ); Chasselas Saint Fiacre, Muscat Ottonel, Muscat Ottonel Blanc ( France ); Moscato Ottonel ( Italy ); Nutmeg Otonel Bijeli ( Croatia ); Gourmet, White Muscat Ottonel ( Austria ); Tamîioasa Ottonel ( Romania ); Nutmeg Ottonel ( Slovenia ); Muscadel Ottonel ( South Africa ); Ottonel Muskotály ( Hungary ). The early ripening vine is prone to both mildews and Botrytis and tends to Verrieseln, It produces greenish-yellow, spicy white wines of low alcohol content with citrus flavor and intense nutmeg, Muscat Ottonel is one of the bouquet places and is also a popular one table grape, In Austria she took in 2009 with falling tendency 360 hectares of vineyards and is happy here for noble sweet Wines used. There was more acreage in European countries Germany (12 ha), Bulgaria (3,236 ha), France in Alsace (165 ha), Moldova (1,520 ha), Romania (3,641 ha), Russia (34 ha), Switzerland (4 ha), Slovakia (48 ha), Czech Republic (60 ha) and Hungary (1,232 ha). Overseas the variety was in Canada. South Africa. United States (New York) and Uruguay (7 ha) represented. It occupied in 2010 a total of 10,234 hectares of vineyards with falling trend (ten years earlier, there were 12,259 hectares). It thus proved in the worldwide varieties ranking Rank 68. This page was last modified at 2 January 2019 at 16:16.